Writing from Lecompton, William Leamer described several families who had slaves when he arrived in Kansas Territory in 1856. The information is very brief. This item is from information collected by Miss Zu Adams in 1895. 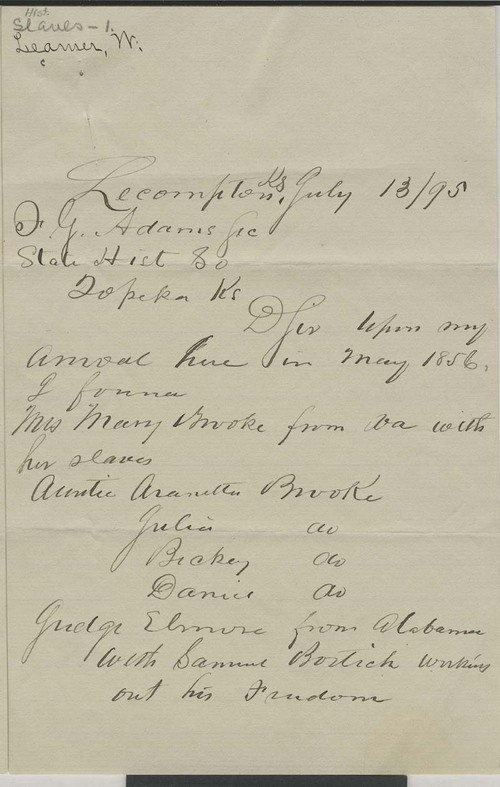 She was researching the topic of slaves in Kansas and contacted a number of early Kansas settlers requesting information about slaves brought to Kansas Territory. While all of the information she collected was based on reminiscences, it still provides useful information that is difficult, if not impossible, to find elsewhere. Miss Adams and her father F. G. Adams were employees of the Kansas State Historical Society and the information received was donated to that institution.